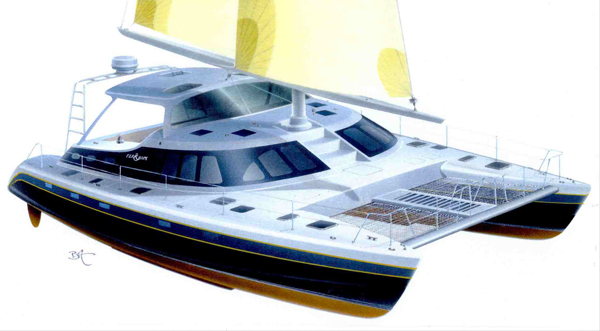 In July 1995 I was asked by Dr. Ian Munro to design a new large cruising catamaran with an Aerorig. Dr. Munro has retired and intends to sail around the world over a period of 10 years with his wife as crew. They have been used to a very comfortable standard of living and wish to cruise without a crew to help, and yet want to have many of the comforts of home, like a washing machine, large galley with refrigeration, and air conditioning. After an initial weight calculation it was clear that the boat would need to be at least 50 ft LOA which I later increased to 52.5 ft when I had completed the final weight calculation to reduce wave making drag. The Aerorig seems like an excellent solution to the problem of handling the rig on a large craft. If good performance is to be achieved, the sails on a 52 ft catamaran would be too large for most people to handle short handed. This is even more relevant to a retired couple who, although they are very fit, will be in their 60s as the voyage progresses. The Aerorig was only just starting to gain acceptance in 1995 and had been fitted to a few smaller Cats. I have made a speciality of designing light weight cruising catamarans with powerful modern high aspect ratio rigs, giving exceptional performance for cruising boats. It was clearly going to be a challenge to design and engineer a boat to take an Aerorig with enough sail area to power the yacht properly, and still keep the weight of the structure low enough to give good performance. A further feature which is possible on a multihull, is to bring all the controls down through the mast and out through a turning block at the base of the mast. Then lead all the lines back to the cockpit. This is particularly suited to a catamaran because the lines can come out of the mast under the bridgedeck sole. After some discussion Carbospars agreed to design a new lower bearing to incorporate this feature. 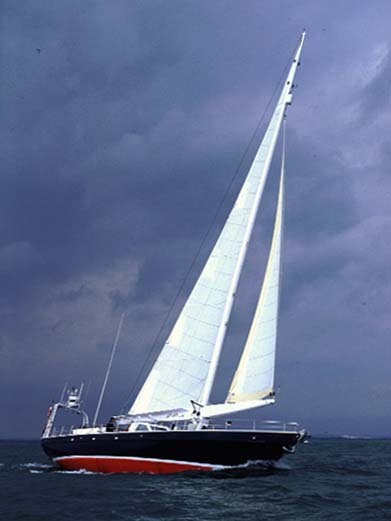 Thus on this boat all sail handling (reefing, sheet tension, etc) can be handled from the helm position. The first problem was to determine rig size. I had already designed two fast cruising Cats at 50 ft LOA. The Tektron 50 displaced 5 tonnes and the Tektron 50 Cruiser 7.5 tonnes. The working sail area on the Tektron 50 cruiser = 148.5 m2. The mast weight was 400 Kgs, boom = 60 Kgs., rigging = 120 Kgs. including chainplates. The forward cross beam for the forestay was 60 Kgs., and the Spinnaker and light Genoa = 75 kgs. Making a total weight of 715 Kgs. For the Aerorig the predicted mast weight for 110m2 sail area was mast 500 Kgs., boom 330 Kgs., and the forward beam would be 30 kgs (the Aerorig has no spinnaker or light genoa. )This gives a total weight of 860 kgs. Increasing the sail area by 10m2 would increase the weight of the rig alone by 65 Kgs.. 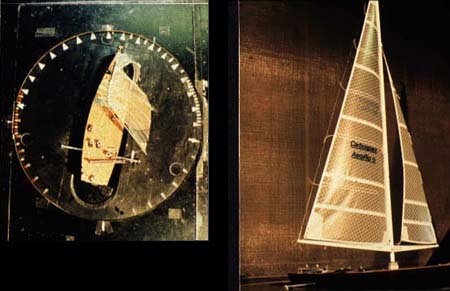 The photographs below, "windtunnel 1, 2, and 3" show an Aerorig being tested in a wind tunnel with a conventional rig of the same sail area, on three points of sailing. Upwind, reaching and downwind. 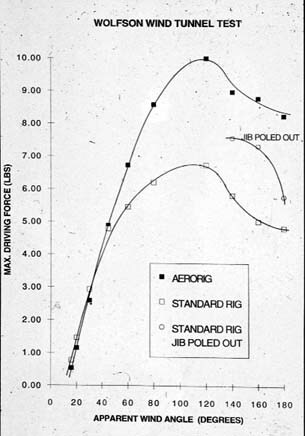 The graph below, derived from these tests show that on a reach with the wind at 60 degrees apparent the rig will develop at least 35% more driving force than a conventional rig. However the Aerorig delivers 16% less drive than a conventional rig at apparent wind angles of 30 degrees or less. This means a loss of tacking angle of 4 degrees. At 35 degrees the efficiency is the same as a conventional rig resulting in no loss of tacking angle. This does not change the performance of the Aerorig 52 because the apparent wind angle will be 35 degrees or over. This is due to the added weight for cruising comforts, and the lower sail area. However increasing the sail area and lightening the boat will not improve windward performance as much as expected, because as the apparent wind angle gets less, the efficiency of the rig decreases. My estimate is that you only get half the benefit. i.e. if you increase sail area by 20 % expecting an improvement of tacking angle of 4 degrees. You will only get an improvement of 2 degrees. My final decision to use the 110 m2 rig ( fig. 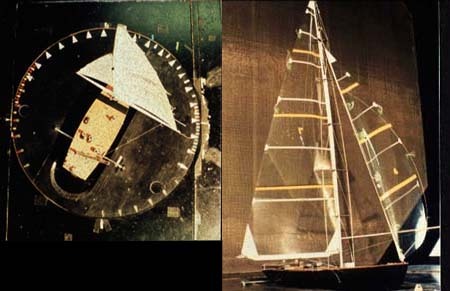 2 shows the Sail Plan ) was also based on the fact that the rig weight was increasing so much, and raising the center of effort would increase the loads in the cabin top. Rig inertia was not a problem since the center of gravity of the Aerorig is at 30 % above the deck, whereas the conventional mast is closer to 50% above deck. Even though the Aerorig is heavier the moment of inertia from the waterline is less. Therefore the Aerorig cat should pitch less thereby improving windward performance in a seaway. When a boat pitches less the apparent wind changes direction less. This can have a dramatic effect on keeping a steady upwind speed. The photographs entitled "Monohull sailing with Aerorig 1, 2, and 3" show a 63ft Monohull upwind, reaching and running. 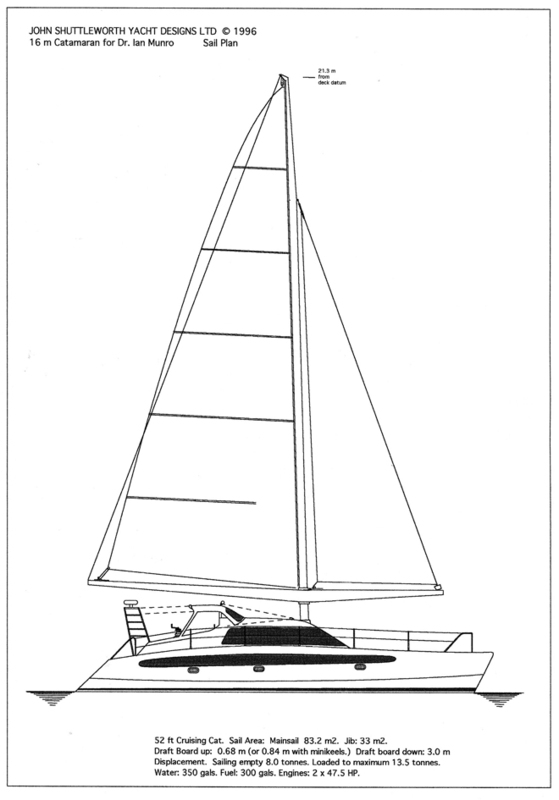 And "Aerorig Monohull 4" shows a dinghy hoisted by the boom as shown on the sail plan of the Aerorig 52 cat in Fig. 2. Over the past 10 years reducing the aerodynamic drag of the boat has been a great interest of mine. For some time now we have had the ability to design a hull and decks for a complete multihull directly on a computer screen (ref. 2). The computer allows us to rotate the hull and draw sections at any angle across the boat. We can therefore see the shapes that the wind is going to flow over in the exact direction that the wind strikes the boat. The wind never comes from dead ahead in a sailing boat. In fact the boat is really moving crabwise through the air, at best the wind crosses the boat at and angle of around 30 degrees from the bow. The effect of windage on windward performance can be calculated. Lack of attention to aerodynamic shaping of the cabin top and deck edges can result in a loss of tacking angle of 5 degrees. In a yacht like this where tacking angle is already lowered by the high weight and smaller rig it is essential to design the cabin top and deck edges as rounded and aerodynamically smooth as possible. (Ref. 1) The Tektron 50 shown in fig. 3 is an example of one of my fast cruiser designs, where I have attempted to design a very smooth aerodynamic shape around the accommodation requirements of the owner. I have therefore paid considerable attention to the most efficient way to "wrap" the boat around the form of a man in such a way that the hulls will move through the air and water as efficiently as possible. After deciding on the position of the cabin top and the position of the rig, I found that it was necessary to make a small pod beneath the bridgedeck sole to take the lower bearing and keep the 1.9 meter bury required by the mast maker. See fig. 5. The height of the bridgedeck sole above the water is very important if the boat is not going to slam in a seaway, causing both unwanted noise, and in extreme cases damage. And at the same time it is important to keep the cabin top as low as possible to reduce aerodynamic drag. The small pod to take the bearing seems like a good compromise, and if the pod hits the water from time to time, it will not be damaged because it is already structurally very strong to take the bearing loads. With a predicted weight and sail area decided, the loads on the mast bearings could be calculated. Carbospars had a requirement of a mast bury ( or distance between the bearings supporting the mast of 1.9 metres.) This gave a maximum load of 34 tonnes at the deck head bearing and 28.4 tonnes at the heel. Fig. 4 shows the polar diagram of the maximum forces that the rig can exert on the deck. These loads can increase by up to 3 tonnes if shock loading is taken into account due to the boat decelerating by falling sideways off a wave or burying the bow. Fig 4 polar diagram of mast loading. 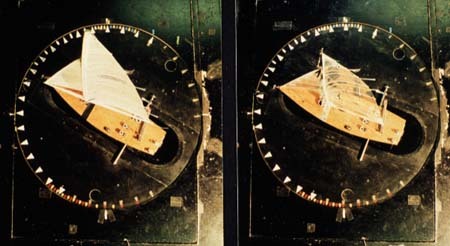 It is immediately apparent that the structure athwartships has to be able to take the loading in both directions, meaning that on one tack the one side of the deck will be in compression and the other in tension, then when the boat tacks the deck that was in tension will be in compression and the deck that was in compression will be in tension. This means that the limiting factor on the design has to be taken into account with the loading reversed on the beam. On the other hand the loading fore and aft is in one direction only. So that the structure aft of the mast in the deck head only has to take tensile loads and bridgedeck sole takes compression only. See fig. 5. Fig 5 cabin top mast bearing loads. 2.1 (a) Construction and fatigue. 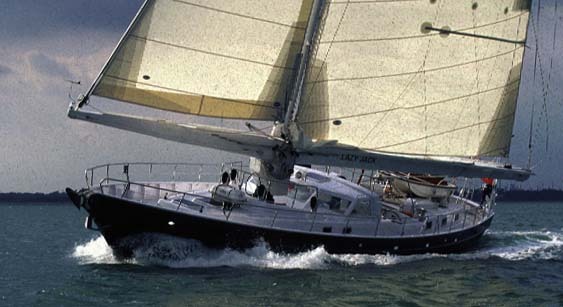 During the lifespan of a multihull it is subjected to many cycles of a complex array of loads, and if the boat is to survive in all conditions without damage careful attention has to be paid to avoiding stress concentrations in the structure, and to the long term fatigue of the materials used to build it. By using a computer to analyze the loads at any point in the boat, and then laying appropriate amounts of fibers aligned in the direction of the stress, the stiffness and the strength of the boat can be greatly increased. While at the same time weight can be saved by removing excess material where it is not required. This weight saving actually increases the strength of the boat, because it not only reduces the loads that the boat experiences, but it reduces stress concentrations, which are a major cause of fatigue failure. I have called this technique of designing integrated structure. ( ref. 4) If the structural design is carried out in this way, and adequate allowance is made in the fiber stress levels in the all parts of the boat to account for long term fatigue, the lifespan of the boat will be greatly increased. At present, research indicates that if a composite laminate can survive over 10 million cycles, it will last indefinitely. In general in order to achieve this, a factor of safety of at least 10 is required. In all my cruising designs I use at least 10 as a factor of safety in areas of maximum stress. For carbon in particular the laminate is strain limited because the material is so stiff, has a relatively low strain to failure, and an extremely high notch sensitivity. However the material can be very successfully used in areas where great stiffness is required, like the cross beams of a multihull. 2.1(b) Decision to use a spaceframe. One of the best features of a bridgedeck saloon catamaran, namely the open plan galley and saloon with all round view through the windows. See fig. 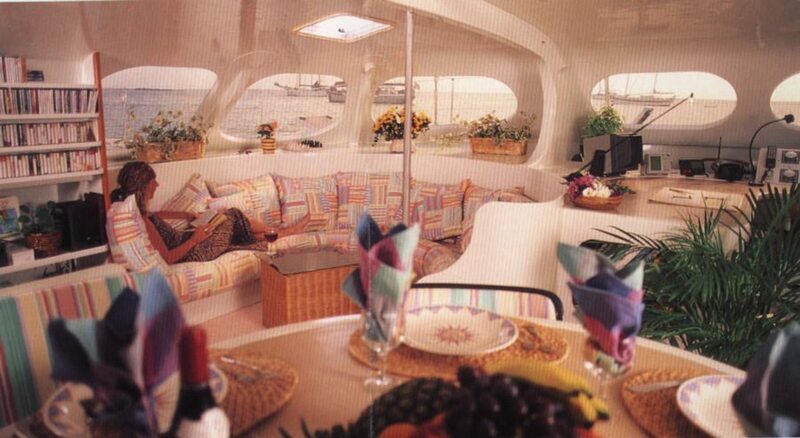 6, which shows the open plan and windows of a 63 ft cruising catamaran of my design. Fig 6 63 ft cruising catamaran interior. 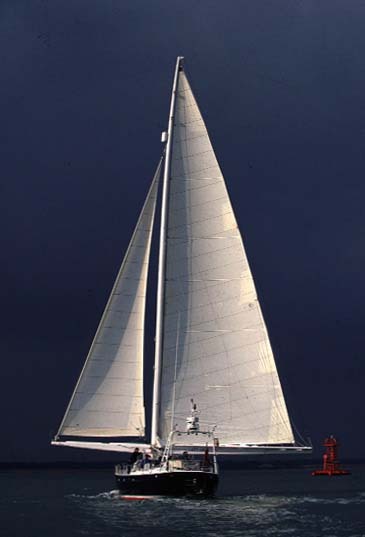 On a normal catamaran the cross beam is mostly stressed by the compression at the base of the mast. The beam deflects as shown in fig.. 7. While the beam with an aerorig in the center with no stays or shrouds, deflects as shown in fig. 8. In order to be able to have the open plan feature and the large open windows in the saloon it is essential the the cabin top deflects as little as possible or the windows will leak and at worst will crack. The cabin top is a big area on the boat and I have found that it is better to make the cabin top as light as possible and control the deflection in the beam structure. The advantage of using carbon fiber in this case is that it is lighter than unidirectional glass and because it is so stiff, the loads will all concentrate in the carbon struts, leaving the cabin top unloaded. Also since the beam is taking all the load it is possible to calculate and control the deflection more easily than in a complex monocoque design, which uses the cabin roof to take all the loads. Normally I use carbon fiber in a simple box beam structure where the deflections can be easily predicted. This boxbeam normally runs below the window line so there is no problem with the view from the saloon. However as soon as I started to design for the Aerorig I discovered that I would have to take advantage of the full height of the coachroof in order to make a beam that did not deflect too much, and that would be similar in weight to the normal cross beams that I was used to designing for this size catamaran. And the only way to be able to look through the beam was to use a space frame. Fig. 10 shows the layout of the spaceframe I sent to Vectayn Ltd. for a finite element analysis. 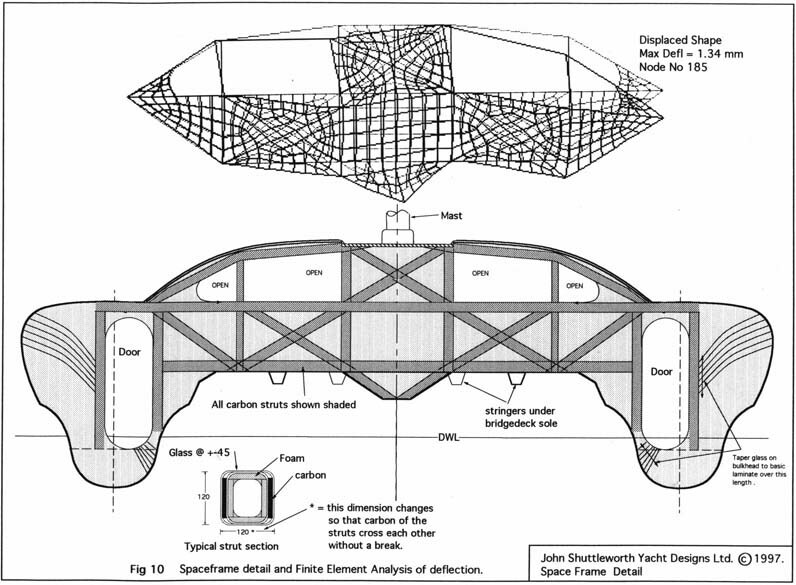 Fig 9 Finite element analysis. We studied 10 configurations, including no top struts and no diagonals, and three different bulkhead thicknesses. As a result of this analysis I concluded that the optimum configuration for minimum deflection would be a space frame with bulkheads positioned as shown in fig. 10. The finite element analysis gave tensile. 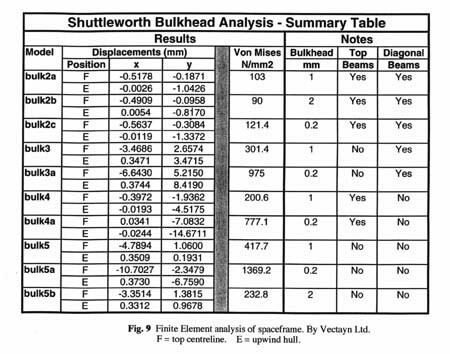 compression, and shear loadings in the struts and in the bulkhead. Building the spaceframe in carbon fiber posed some interesting problems at the joints. My solution to this was to run the unidirectional carbon past the joints. In order to avoid having to cut and join the carbon at where the struts cross each other, I designed each strut exactly the right size so that the carbon on the flanges of the strut could run over the strut it intersects. This is shown in fig. 11. Shear loads in the struts are taken by 45 degree glass unidirectional wrapped around the struts. Each strut is designed specifically for the load it will carry according the Finite Element Analysis. Fig 11 carbon structs detail. The final weight of the cross beam as a spaceframe came out very similar to the weight of the carbon box beam I would use on a similar sized craft. There is some additional weight in the deck structure and in the torsional box. This structure will add a further 100 kgs to the total weight. 2.1(d) Fore and aft loads. Fore and aft loading is simpler to account for in the structure. Along the bridgedeck sole there are 5 box stringers to stop the sole flexing under wave impact. These struts double as compression beams to take the aft thrust from the lower bearing. Fig 12 cabin top construction. I have shown in a previous article (ref. 4) that if the length to beam ratio is under 8 the hull starts to create noticeable wave making drag. The effect of this is that there will be a "hump" of performance where the speed will "stick" until there is considerably more input of power. This occurs at a speed of 1.34 multiplied by the square root of the waterline length. Further tank testing that I have done on catamaran hull forms close to the waterline length and weight expected in this design show that there is an optimum relationship between length to beam ratio, prismatic coefficient, length to draft and wetted surface area. For instance decreasing length to beam ratio by increasing the length to draft ration does not necessarily result in a faster design. Also the hulls have to be tested at lighter displacement and heavier displacements to simulate the actual sailing conditions, where one hull is always lifting and the other is depressed, except when going directly downwind. I used three conditions to test the hull form namely 75%, 100%, and 125% of the static displacement. In the tank test I evaluated the drag of 4 hull forms at these displacements and at speeds in the range of 8 to 20 knots. Wetted surface area = 24.36 sq. metres per hull. Above the waterline the hull flares rapidly ( see cross section in fig. 10 ). This has the effect of increasing the interior volume without increasing the windage. (Remember the wind is never closer ahead than 30 degrees off the bow). Also the flare can be used to flare the forward sections of the hull more than the aft sections. 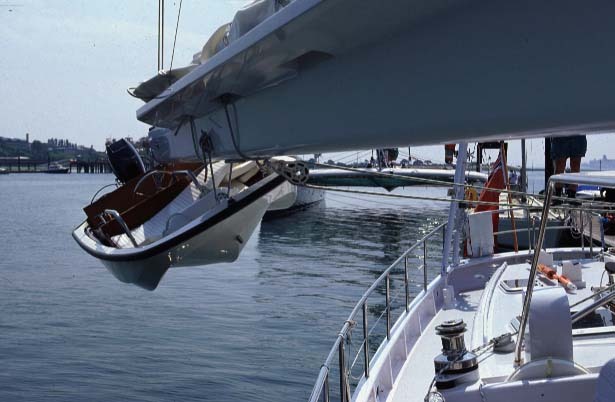 This can reduce bow down rotation due to the sail force, helping to keep the bow up when sailing on a reach. 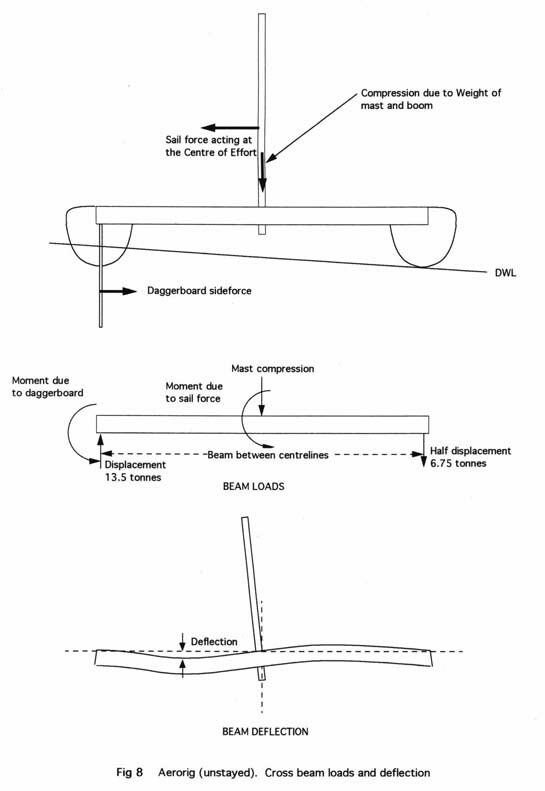 Fig.10 also shows clearly how much of the boat is in the air compared to the small amount of hull below the waterline. It is obvious from this perspective that aerodynamic drag is of great significance in a cruising multihull. This design, like all my cruising designs uses only one retractable daggerboard in one hull. Some years ago I conducted a tank test to find out the validity of this idea, and the test showed that one board in one hull had less drag that one in each hull. The only difference was a loss in tacking angle of 1.5 degrees when the board was upwind. I believe this loss is mostly compensated for by the saving in weight of a board and case. The daggerboard and rudder are both designed using NACA sections. The balanced rudders use a section that is tolerant to high angles of attack, while the daggerboard which is mostly at a maximum angle of attack 5 to 6 degrees, has a section which has lower drag and better lift to drag at 5 degrees than the rudder. The advantage of a daggerboard on a multihull, as opposed to a keel on a monohull, is that it does not have to be very low drag when going straight through the water, since it will be retracted when going downwind. On this design I have included a shallow stub keel on each hull to protect the propellers of the twin engine installation. The rudders kick up so that the draft of the boat at full displacement is only 0.83 metre ( 2 ft 8 inches ) fully loaded. 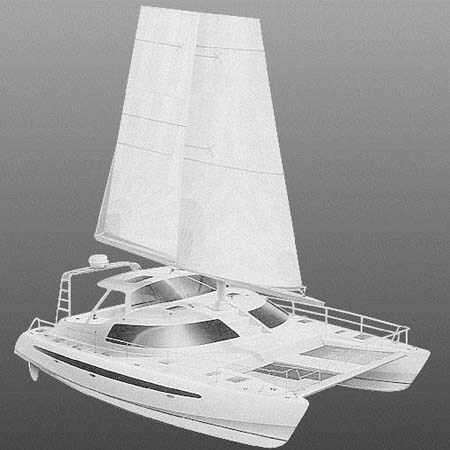 It is possible to design a large cruising catamaran with a very easy to handle rig. The total increase in weight is expected to be 245 kgs. Performance on a reach will be similar to a conventional design, and upwind, the yacht will point about 3 degrees further off the wind than one of my conventional designs with 35% larger sail area. ( Tacking through a total of 6 degrees more.) I must add here that a conventional design of mine usually has a sail area of 35% more than most other cruising designs of comparable size. Therefore my expectation is that this yacht will still outperform most other cruising catamarans of this size, both upwind and on a reach. New design criteria are required to take the sideloads and fore and aft loads generated by the rig. Beam deflections are more difficult to predict, and distribution of the very high loading is difficult into the lightweight deck structure. The spaceframe design is a good solution to the problem. I will be thinking about ways to simplify the structure further in future designs, with the intention of improving building techniques and saving weight. Aerodynamic shaping of the boat is essential if good windward performance is to be achieved with the less efficient rig. One way to improve this would be to increase rig size. Once this design is sailing we will be able to evaluate the possibility of increasing mast height and hence sail area, with possibly less weight increase, depending on how much flexing is allowed. If the mast bends off too much, power will be lost, giving away the advantage of the taller mast. The 3D drawing of the Aerorig 52 shows the final shape of the boat. 17. JAMES, R.: Multihulls Offshore, Nautical Books, U.K. 1983. 18. KRUSHKOV, PROF, U.S.: Dynamic Stability of Sailing Multihulls. Edited and appended by H. A. Myers, January 1981.